WE NEED YOU! 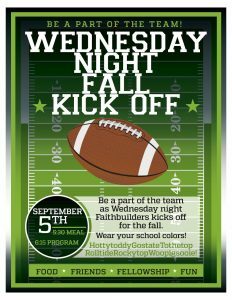 Plan to attend “The Kickoff” on September 5 beginning with supper at 5:30 p.m. Wear your team colors! Wednesday nights at FPC offer an opportunity for us to share a meal together while spending time in fellowship, but it is just not the same without you! Consider this a “team” meeting! The Christian Education Committee has worked very hard to plan an interesting slate of programming for the adults while the children again participate in Faithbuilders, a program that teaches the children about God and His love for us through storytelling, crafts and music. We hope that you will participate in this time of fellowship.